There are many items I could discuss in this blog post, but I will save them for later, since I what to discuss is going to take some time. I am concerned by the recent decision on the digital billboard by the city council. The process was so messy that the public never got a chance to learn what the issues are. I think that ultimately the council (including me) failed to fulfill its obligation to provide information and have a well-informed discussion about the options. So in the next several paragraphs, I want to have the conversation that I wish was held at the council meeting. The billboard per se is not a huge issue, although $150K annually sure would be nice. But it is worth exploring because it shows how good local-government decision making can go astray, and I don’t want to see that happen again in Albany. In particular, I am directing this post to residents of the three Pierce St. condos, but I hope other Albany residents find it useful. This issues are nitty-gritty, but hey, that’s what local government is about. The City of Albany needs a new public works center for storing the vehicles, equipment and supplies that the maintenance staff uses for repairing pavement, sewers, trimming vegetation, etc. Office space is necessary, too. Currently the city is leasing a building along Cleveland Ave., but we have outgrown the building and the lease is getting expensive. The city was able to purchase the site of the old Western Forge and Flange building just a few sites north of our current facility. The new location is 540 Cleveland Ave. The site is between the two freeways at the foot of Albany Hill, in front of the middle condos at 545 Pierce St. (images below). The old building there has been torn down and the lot has been prepared. To help fund the project, the city planned to install a digital billboard which would bring in $150,000 in rental income annually. In my discussion with the city staff, I was aware there was more than one option being discussed. The options involved removing (or not) the utility poles and wires alongside the freeway, which would allow the billboard to be lower. The digital billboard company, Clear Channel, had agreed to pay all costs for the billboard, but the city would have to absorb the costs of undergrounding the utilities, an amount of roughly $100-200K. Although that option was ugly, I was more concerned about wasn’t there—the other option that showed what the digital billboard would have looked like if we had undergrounded the utilities behind the new public works center. For some reason drawings of that option were not included. I’d like to think that, had I noticed this omission earlier, I would have asked that the other drawing be included. At the end of the May 19 meeting, I stated publicly that I really couldn’t get a sense for what that billboard looked like in context of the surrounding space, so I decided to find out. Contrary to what many condo residents may think, I have, along with other council members, spent many hours in the neighborhood of the condos, visiting friends there, visiting the site of Pierce Street Park, driving along the street to think about the best location for the crosswalk, and measuring distances to the three condos in Google Earth. Let me show you what I discovered during my field research. Image One below is a screen shot I grabbed from Google Maps. 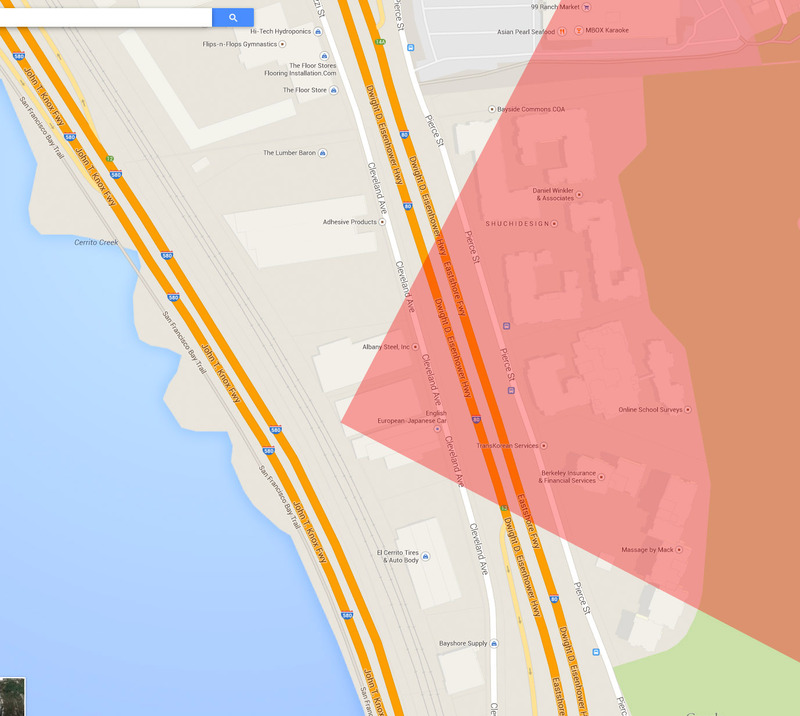 Based on the specifications in the billboard drawings linked above, the red area shows the region that would be in the shade of the digital billboard. Note the outline of the condos in in the Google Maps image. Image One: Shadow of digital billboard. Red indicates region from where face of sign would not be visible. No one in the middle condos would be able to see the front of the sign. However, residents of the far northern and far southern condos would be able to see the front of the sign from their buildings. This is a show-stopper for me, as it was for Mayor Thomsen when I showed her this image. Some additional screening could have solved this problem, but it doesn’t matter, because there is even a bigger problem. Please take a long look at Image Two below. I will refer to it several times. This shot was taken from the parking garage in the middle condo complex (545 Pierce St.). The camera is looking west across the vacant lot where Western Forge and Flange used to be. This vacant lot will be the location of the new City of Albany public works center. 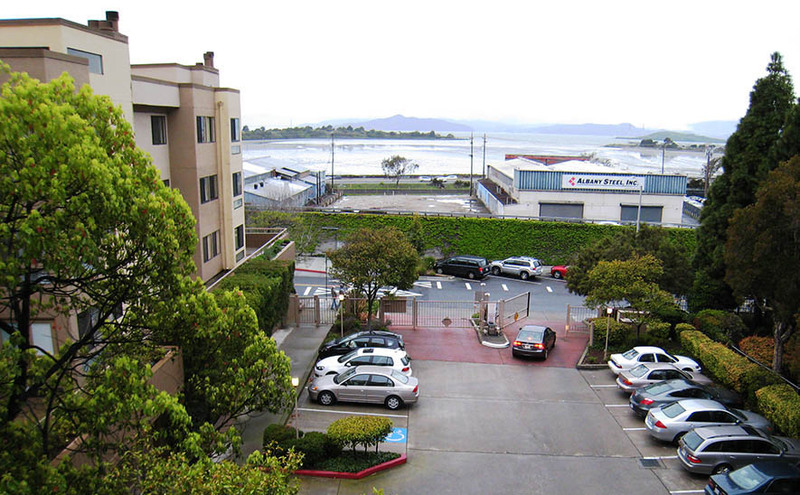 Image Two: View looking west from garage of 545 Pierce St., the middle condo complex. In particular note the tree you can see at the far end of the vacant lot, and if you can see them, notice the utility poles on the near side of I-580 that frame the tree. You cannot see the I-80 freeway in this photo because it is blocked by the wall of greenery just behind the row of diagonally parked cars on Pierce St. in the middle of the photo. Image Three below is taken at the same location, but from the I-580 freeway. This is a screen shot from a Google Maps street view photo. 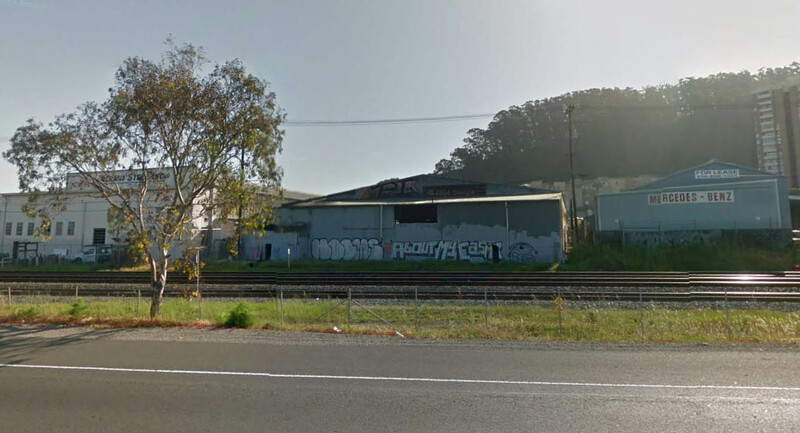 Image Three: View from northbound lane of I-580, showing backside of former Western Forge and Flange building, now a vacant lot where City of Albany public works center will be constructed. Notice the same tree. The graffiti-covered building in Image Three is no longer there. That’s the backside of the old Western Forge and Flange building that has been torn down to make room for the public works center. Also notice the same utility poles that you can see in Image Two. The option shown in the May 19 city council agenda mounts the digital billboard over the top of the back of the new maintenance center to clear these utility poles. In order to mount the sign lower, behind the new public works building, the utilities would have to be undergrounded. Now please look again at Image Two. If you look at the height of the utility wires, you can tell that a sign mounted at that height or above would block the view not of the water, but of the landforms in the background–the Albany Bulb and Angel Island. For me, this is another show-stopper. I can’t imagine that any member of the city council would have approved this plan, had we gotten far enough along in the process to see how high the sign would have been. In fact, I doubt if the sign would have survived the design review process in the Planning and Zoning Commission. All along, there was was a better option, but one that we never saw–so let’s explore it now. 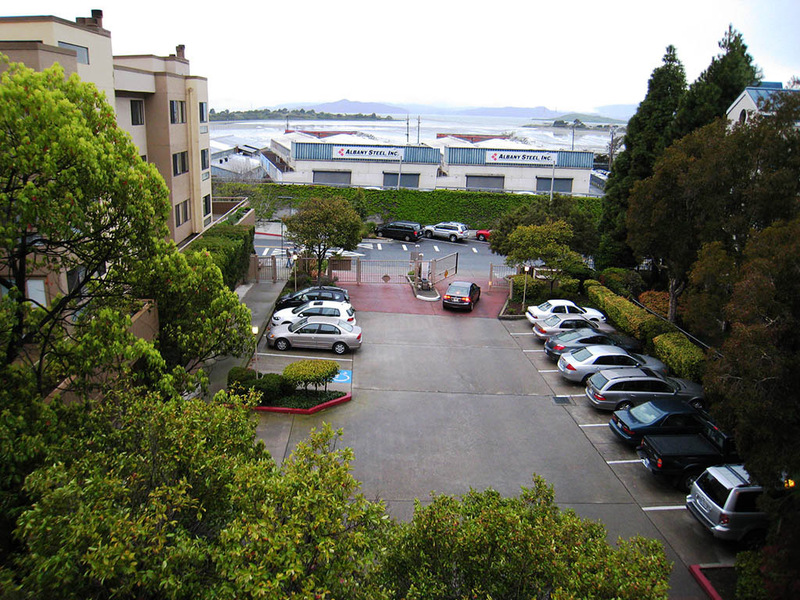 If you return once again to the parking lot view of Image Two above, you can see a large freeway sign in the image. It’s hard to make out if you don’t already know it is there, but Image Four below makes it clear. Image Four: Albany Steel building. Large sign is about 8 x 54 feet. On the back of the Albany Steel building just north of the site of the new public works center is a big freeway sign. It is unlit, it is not digital, and by my estimates, it is about 8 feet high and 54 feet wide. By comparison, the length of one panel of the digital billboard is 48 feet, and is probably the standard height of 14 feet. In other words, one panel of the digital billboard would be taller but not as long as the Albany Steel sign. As part of the digital billboard, there would be two panels arranged in a triangle facing the freeway, as in the illustration in the May 19 city council link shows. Image Five: View from garage with Albany Steel building cloned into public works space. This is the same photo in Image Two above, but I have cloned in a copy of the Albany Steel building where the public works center will be (the city’s building will be much more attractive). This is a useful comparison because, based on city records, the height of the Albany Steel sign is 42 feet above grade. The height of the public works center is about 40 feet, and if the utilities are undergrounded, the height of the top of the digital billboard behind the public works center would be three feet above the roof line. In addition, it appears in Google Earth that the elevation of the grade level in the public works lot is about one foot lower than the Albany Steel lot. That means a digital billboard tucked behind the public works center should be at the same height as the cloned building sign in Image Five above. It is important to keep in mind that the height limit in the CMX (commercial mixed-use) zone is 45 feet. So, for example, if the City of Albany hadn’t bought this property, a private company could have bought it and built a building up to 45 feet above grade level. With undergrounded utilities, a digital billboard would be below the CMX height limit. I would like to see a better analysis of this option with accurate drawings, but based on what I know now, as a council member, I would be willing to accept a digital billboard if three additional conditions are met: 1) No one living in the condos could see the front side of the billboard, 2) The sign is below the height limit in the CMX zone, and 3) The P&Z design review process has been completed before the proposal reaches the city council. I would be happy to see these conditions added to the digital billboard ordinance–and if they were, I’d vote to keep the ordinance. What has been consistently left of out this story is that the digital billboard plan was always intended to be swap. 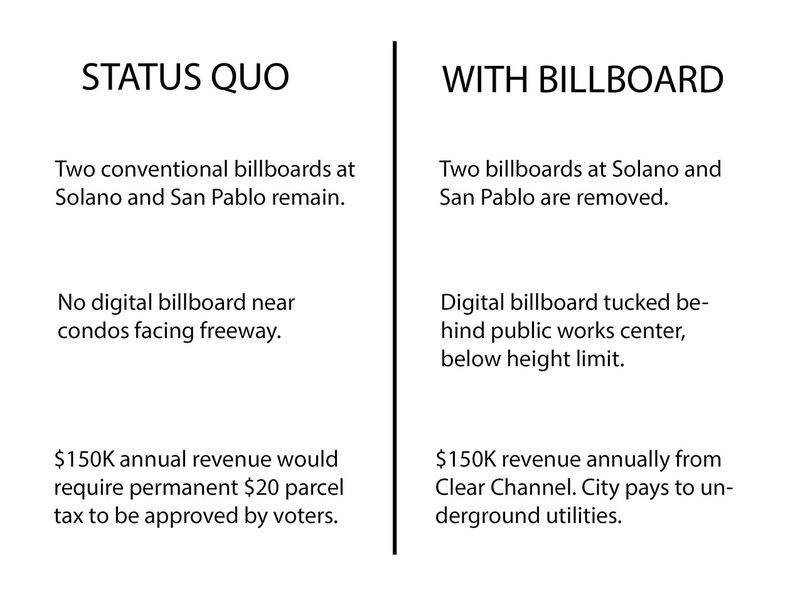 Two conventional billboards would be removed from on top of the Montero’s building at San Pablo and Solano, and two digital billboards would be added facing the freeway in front of the condos. To make the revenue comparison equal on both sides, replacing the $150K of billboard revenue would require a permanent parcel tax of about $20 annually, according to an estimate from P&Z Commissioner Doug Donaldson at the June 25 P&Z meeting. That’s assuming the voters would go for it. Many might prefer the billboard option. So here are the two options side-by-side. I think the billboard option is better for Albany, and I think it’s better for the condos, too, since there is a good argument to be made that billboard revenue should stay local. I personally would be overjoyed to see the extra revenue stay in the neighborhood by using it to help build Pierce St. Park. We’ve had trouble finding money during the last several months. You might disagree, but at least now we have more information and can make better comparisons.